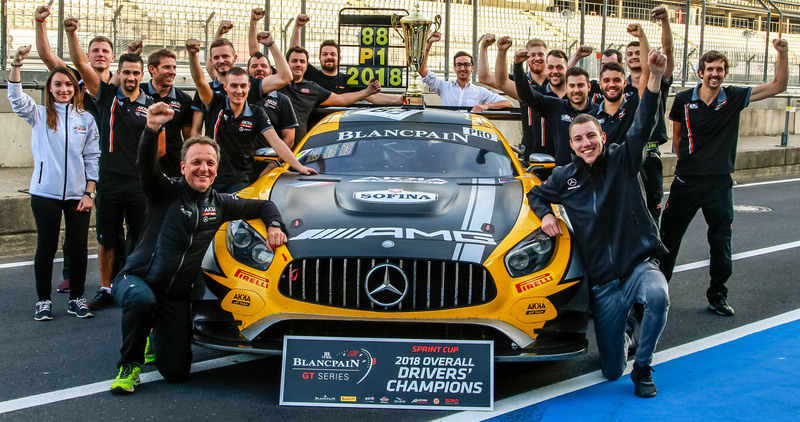 BLANCPAIN GT SERIES - SPRINT CUP - VICTORY AND DRIVERS\' TITLE! Victory and 2018 Drivers Title for Marciello and Meadows: full marks for AKKA-ASP! The Nürburgring circuit is not quite like any other, both technical and testing, and, like its close ‘neighbour’ the other side of the Eifel – the circuit of Spa-Francorchamps – notorious for its changeable weather. This weekend, there were no bad surprises as far as the weather was concerned, although temperatures were rather chilly. There were some changes in the AKKA-ASP clan, as Nico Jamin had a new team-mate. Having shared the cockpit of his Mercedes-AMG GT3 with Denis Bulatov, it was the turn of Adam Christodoulou to share the #87. Adam is hardly a newcomer to the French team, having driven in Silverstone with Tristan Vautier and Raffaele Marciello, and then in the 1000 km of the Circuit Paul Ricard with Raffaele Marciello and Thomas Jäger. For the pair of Marciello and Meadows, this final round of the Sprint Cup was a case of double or nothing. Having set the last two pole positions and scored points in every race, nothing was settled for the joint Championship leaders. It was the same for the team title. With a deficit of 10.5 points, AKKA-ASP was still in the race but had some tough opponents.